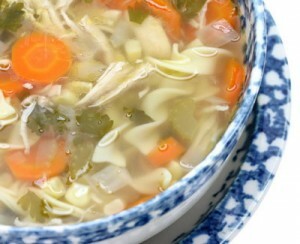 Chicken Noodle Soup recipe by Marium at DesiRecipes.com. Place the halved onion , bay leaves, peppercorns, whole celery, whole carrots and lemon grass in the pot and simmer, covered 1 hour. Strain broth and reserve chicken . When chicken is cool enough to handle, remove skin and cut meat into bite-size pieces.